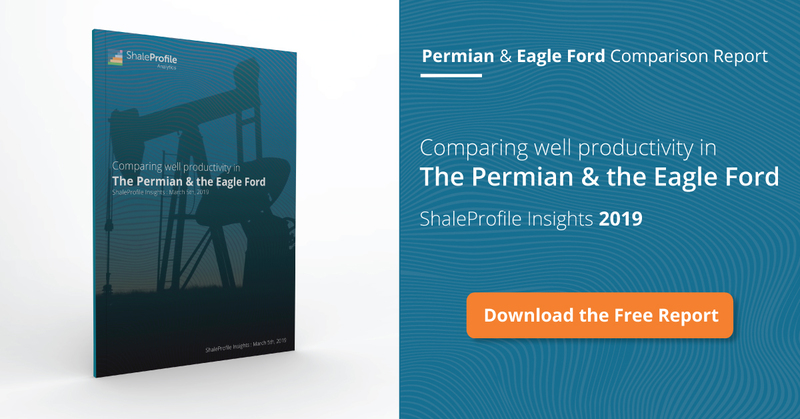 This interactive presentation contains the latest oil & gas production data from all 14,727 horizontal wells in the Permian (Texas & New Mexico) that started producing since 2009/2010, through January. With more and more revision data coming in for 2017, the astonishing rise of oil production in the Permian is becoming more clear, as shown in the above graph. In December, based on preliminary data, 1.25 million barrels of oil per day were produced just from wells that started producing in 2017 (more than 60% of total production as the blue area shows). More horizontal wells were completed in this region compared with 2016 (3143 vs 2214), at 8 thousand feet they were on average 10% longer, and proppant volumes were up by a massive 30% to over 14 million pounds per completion. These changes in well design also had an impact on productivity, as you can see in the ‘Well quality’ tab. Initial well performance was again better in 2017, although the year-over-year improvement was smaller than in previous years. The ramp-up in newly producing wells can be seen in the ‘Well status’ overview. Data for DUCs is still incomplete for the last couple of months. The top 3 operators in this region, Pioneer Natural Resources, Concho Resources, and EOG all strongly grew production in the past 2 years (‘Top operators’). This “Ultimate recovery” overview shows the average production rate for these wells, plotted against their ultimate recovery. Wells are grouped by the quarter in which production started. While wells that started before 2015 are now at or below a level of 50 barrels of oil per day, recently completed wells are peaking near 700 barrels of oil per day in their first full calendar month on production. If you’re interested to see where all these wells are located, you can find them on a map, and colored by status, in the ‘Well status map’ (3rd tab). As usual, tooltips in the map give more info. The top chart in the 5th tab (‘Productivity over time’), shows that, based on the cumulative production in the first 2 years, well productivity has increased threefold in the 2010-2016 time frame. Wells that started in early 2016 were able to recover on average 165 thousand barrels of oil in the first 2 years on production. Later this week I will have an update on all 10 covered states in the US, followed by a post next week on North Dakota. You can follow me here on Twitter. Note that a significant portion of production in the Permian comes from vertical wells and/or wells that started production before 2010, which are excluded from these presentations. In older Permian presentations there were about 7% of horizontal wells whose production could not be separated from other wells (I think). That no longer seems to be the case, is this output now placed in the “other” formation? This may have happened in some earlier presentation, but I just noticed the change this month. Indeed about 8 months ago I made improvements in the way the Texas data is handled. By utilizing more well data (well tests, pending production, proration schedule), it also became possible to make reasonable estimates for the production from wells that were part of very large leases, which was indeed the missing ~7 % before. The formation of these wells was already quite accurate (the accuracy depends on how well operators fill in the required completion reports). It is interesting to compare great groups of wells from the different plays. 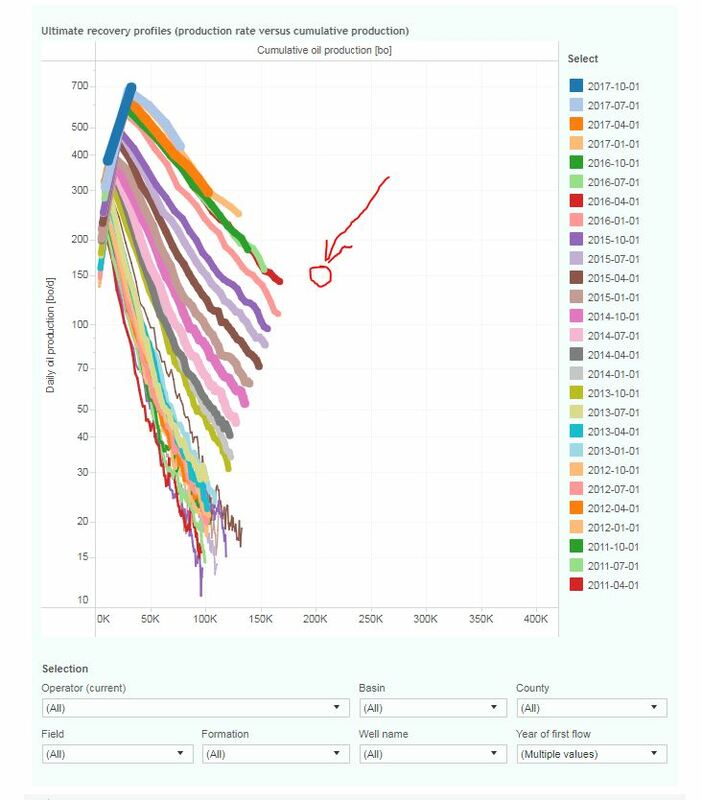 It seems that wells that pass 200 MSTBO in oil recovery at over 200 BOPD are in the top ten percentile. 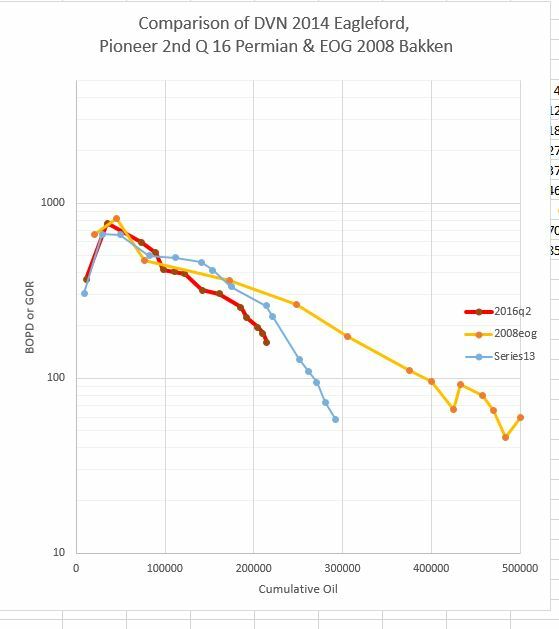 The graph below compares the performance of 3 groups that surpass that hurdle- the Pioneer 2q 2016 Permian Wells, the DVN 2014 Eagleford Wells, and the EOG 2008 Bakken Wells. I think claims that the Permian wells are 1.5 MMBOE at 60% oil are not realistic. Thanks as always for your analyses Jim, very interesting comparison indeed. Your welcome. It seems in these 3-4 MCF/bbl GOR plays, you better exceed 200 BOPD at 200 MSTBO if you want to make 300 MSTBO. Note the error in the graph above- circle should be 50 BOPD higher. What do you think the average Permian well will produce over their life. Also, how long do you think they will produce for in years. I have read pressure studies that says if they space the wells 6 wells per section. The average well will only produce 10 barrels a day in year 7 to 8. These people saying that a shale well will produce for 30 years I don’t have an idea where they come up with that data.